Are you looking for something a little bit different? A place a ‘bit out of the way’ and ‘off the beaten track’? Self-catering but comfortable? Somewhere near the sea with walks and nice places of interest to visit? How about a family built log cabin? We have just the place. A real one, built with proper big logs cut and carried and placed by a forester for his family to holiday in. And now welcome you to come and stay in it too. 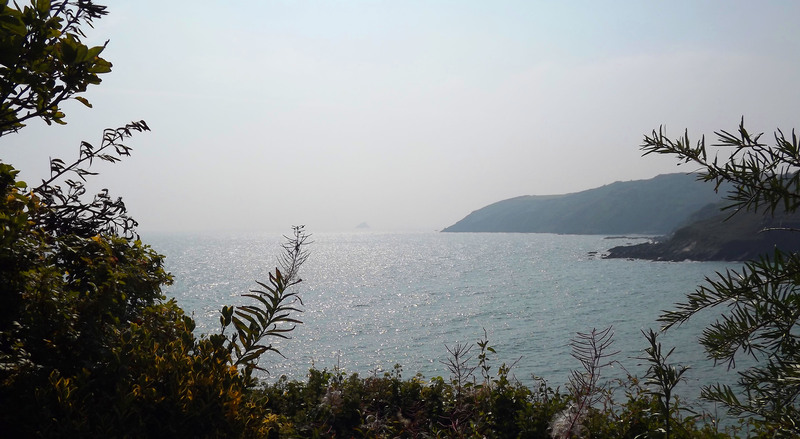 The cabin is on the hillside overlooking East Portholland bay, the coast path and coastline beyond. After a slight climb up the coast path and a further 24 steps to the decking you can turn and look at the stunning view. Turn back and enter through double glazed glass doors to the outer cabin where there is a ‘pot bellied’ wood burning stove for those cool evenings, a table and chairs, TV and a few books. Continue further and enter the main cabin where you will find a small well-equipped kitchen, double bed settee and twin bunk beds (stored against the wall if not needed), a small wet room and toilet. Have a good look around it with the video or check it out in pictures in the gallery. The cabin sleeps 4 comfortably. Mobile phones have a poor reception here so we offer free WIFI. The cabin is let at £85 per night or on a weekly basis of £600 per week with a non-returnable deposit of £100 on booking. We are open all year and changeover day is a Saturday with arrival after 3pm and departure by 10am. Credit and debit card facilities are not available. We are open throughout the year and positively welcome all regardless of orientation or gender, but we are unable to accommodate pets and smokers.